Did you want to do some fun, educational and engaging St. Patrick’s Day activities with children? If so, you have come to the right place! Our activities are widely used by teachers, moms, dads, child care providers etc. for learning and teaching while being fun for the kids! Cookie cutters into paint and either paint a sweatshirt or on large pieces of paper. 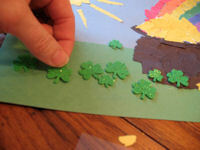 Cut out a large shamrock and let the child paste, paint, color all over it. Depending on the age, the child can later cut it into several pieces and let them put the puzzle together!! Take children into back yard or a park and have them look for four leaf clovers. We actually found one last year!! !— This can be done inside as well by making a construction paper clover and 1 four leaf shamrock and have the kids try and find it. While the children are out playing or before they arrive make some silly changes in the room like putting things out of place, hiding things, leaving gold chocolate coins, etc. Leave green footprints. Blame it on the leprechaun when they come in. 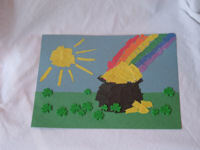 Explain all about St. Patrick’s day and leprechauns. Scatter gold chocolate coins in yard before children arrive and have fun searching for the “luck” left by the leprechauns. Cut out a shamrock shape and have a box of green collage materials- yarn, fabric, ribbon, buttons, glitter. 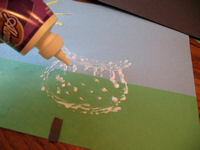 Add green coloring to glue and let them decorate. Color all three paper plates green. Cut a stem from green construction paper. Glue the three paper plates together and in a triangle type shape. Then glue the stem at the bottom. Cut Coffee filter in the shape of a shamrock. Put water in two baby food jars. Add yellow food color in one jar and blue in the other. Give the children Q-tips and let them mix the colors on the coffee filter. You end up with a very interesting green shamrock. I bent the glitzy chenille stick into a shamrock shape. The kids glued on the 1′ pom pom. They glued on the shamrock ribbon in the back. They glued on the two eyes. Then they glued on the feather. I glued the pin in the back with glue gun. 5. Give each child a small bowl with green rice in it, let child sprinkle rice all over glue, let dry. Two weeks ago, a leprechaun “lost” all his gold in our play spaces. He left us his pot and a reward notice saying that if we could find all his gold and refill his pot by St. Patrick’s Day, he would leave us a reward. The children have been having a wonderful time finding the gold (gold spray-painted items – anything I could think of – marbles, rocks, buttons, keys, feathers, spoons etc.). Each time they find a piece of gold, they place it in the leprechaun’s pot and I give them a “Lucky Shamrock” sticker to put on their cubby name label (we count how many items we have and how many stickers each child has – Math). On St. Patrick’s Day, the leprechaun will return at nap time and pick up his small pot full of gold – and in return he will leave a large pot (a Halloween witch’s cauldron) full of a reward. The reward will consist of shamrock shaped cookies, a pitcher of lemonade tinted green, festive cups and napkins, and a goodie bag for each child. 1. Cut three heart shapes from the green paper. Glue the tips of the three shapes together to form a shamrock. 4. Cut three or more 3 foot ribbons. Hold the ribbons together and staple them to the back of the shamrock at the center so that the ends hang down from the shamrock wand. 5. Cut several tiny shamrocks and staple them along the ribbons. Maybe your magic wand will help you catch a leprechaun!! Cut large shamrock shape our of green paper. Fold white paper accordion style for arms and legs. Cut small shamrocks for hands and feet. Glue at ends of accordion arms and legs. Decorate large shamrock as a face. Very Cute! Put tablespoon of pudding mix in sandwich bag and milk, then close the baggy and have kids shake and squeeze, then eat. I’ll give you my pot of gold. I’m a little Leprechaun,short and green. We can see them all. Kids will love making this fun picture for St. Patrick’s Day! Only a few supplies, this project is fun and cost effective! 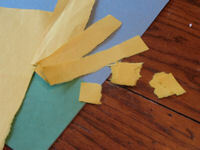 Lay the light blue construction paper onto the work surface in front of the child. Cut a wide strip of green construction paper to fit on the bottom third of the light blue, this will be the grass. Place pattern over the top of your construction paper. 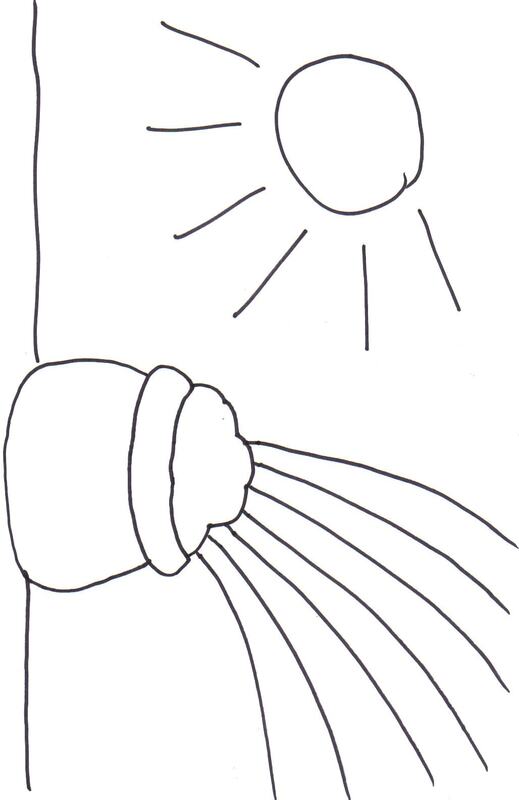 Use a pen or pencil to trace the pattern, press firmly so that the paper underneath is indented. Remove the pattern and lightly trace the indents with pencil or pen. 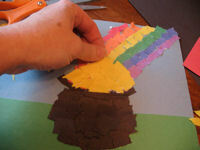 Tear remaining construction paper into strips, then into squares. Apply shamrock stickers to various places on the grass. Keep a stock of construction paper for fun impromptu projects. Buy holiday themed stickers and supplies after each holiday when they go on clearance! If you have carbon paper, you can use this to trace the pattern instead of creating indents and drawing over them.